The comprehensive review of the STCW 1978, as amended in 1995 and associated Code was carried out from 2006 to 2010.These amendments will have a certain degree of impact on Maritime Education and Training(MET) institutes in terms of education andtraining of seafarer worldwide. Particularly, the Far East region countries are effected more than other regions since they covered about30% of officers and 37% ratings in the world. In view of these facts this dissertation conceived to analyze the problems in the Far Eastmain seafarer supply countries faced the implementation of “STCW Manila Amendments” To analyze these problems, this dissertationcarried out questionnaire research to 7 targeted main MET of major Far East seafarer supply countries. After research this dissertationsuggests the possible solutions such as, Joint On-Board Training Center; Joint Asia Maritime E-learning Systems; methods to reducingwork-load, ship inspection burden and determine mandatory minimum safety manning standards in a safe way; technical cooperation fundto installation of training equipment; and clarify vague terminology of STCW Manila Amendments, to solve problems identified throughthe questionnaires. The competence of seafarers is one of the most critical factors in the human element to ensure safe and efficient ship operations. (ISF/ICS, 2011) It is directly related with safety of life at sea and the protection of the marine environment as well. The STCW 78 as amended, constitutes a comprehensive set of regulations intended to maintain the highest standards of competence globally (ISF, 2011). Hence, the International Convention on Standards of Training, Certification and Watch-keeping for Seafarers (STCW) is placed as an important international convention that will affect the human element in the maritime industry. There are about 1.4 million seafarers who were trained under the STCW Convention in the world (BIMCO/ISF, 2010). In addition, there are numerous MET institutions or universities located in these countries. Therefore, comprehensive revisions of STCW Manila Amendments, which completed on June 2010, will be a crucial factor to all seafarer supply countries to ensure that the highest standards of seafarer competence are maintained globally. The STCW Manila Amendments entered into force on 1st January 2012 and have a 5 year grace period until 1st January 2017. Most major seafarer supply countries are now amending or have already amended their regulations to comply with the STCW Manila amendment. However, the same as after the major revision of STCW 1978 in 1995, there will be difficulties or problems met by MET institutes in implementing the new requirements within the country (Maquera, 1998). Therefore alternative proposals or solutions should be available to resolve the difficulties or problems after STCW Manila Amendment. This study will conduct a detailed review of the STCW Manila Amendments and some materials such as related publications, dissertations which done by former World Maritime University students and BIMCO/ISF manpower update report, will be used as the basic source of this dissertation research. Also, a questionnaire survey will be carried out to identify the opinions and status of MET institutes or universities in implementing the STCW Manila Amendments locally. Particularly this dissertation will focus on Far East countries, which are the biggest seafarer supply region among five geographical areas on the BIMCO/ISF 2010 manpower update report. The biggest seafarer supply countries among 27 Far East countries are the Philippines, and followed by China, Indonesia, Vietnam, the Republic of Korea, Singapore and Malaysia in terms of the number of officer supply. Additional research will be carried out from the author’s country such as status of training ship and accident rate of certain type of ships. In addition, the author will carry out a case study to understand hours of rest status in certain type of ships. The comprehensive review of the STCW 78, as amended 95 had made major revisions from Chapter I to VIII of STCW Convention. This chapter will give detailed reviews of the STCW Manila Amendments from Chapter I to VIII with the exceptions of Chapter IV and VII as the amendments are minor. The definitions of several important terms have been revised. The previous term “appropriate certificate”, which was left for interpretation by administrations, has now been defined specifically in the “STCW Manila Amendments” as Certificate of Competency (CoC), Certificate of Proficiency (CoP) and documentary evidence as appropriate to discourage the fraudulent practices for CoC and CoP. New definitions have also been developed to specify the qualification required for Electro-Technical Officers (ETO) and Electro-Technical Ratings (ETR), which was previously not defined in STCW 78, as amended 95. Under STCW 95, there are no requirements on proof of competency for deck and engine ratings. However, in the STCW Manila Amendments, the ratings which are serving on seagoing ships of 500 G/T or more will have to obtain certification showing their competency in areas such as navigation, cargo handling and stowage, controlling the operation of the ship and care for persons, maintenance and repair, at the support level. Due to the development of technology and demand for more convenient training programs, distance learning and E-learning are gaining popularity. To ensure the quality and methodology of such programs, guidance on distance learning and E-learning have been added in Section B-I/6. Currently, many MET institutes or universities in the world are already running the distance learning and E-learning system. However, some MET institutes are facing challenges to cope with these programs especially those in Far East countries where the internet and computer technology is not at an advance stage. The amendments to this chapter covers demonstration of additional competence by the officers at operational level and senior officers at management level in Sections A/II and B/II. The operational level seafarers will have to demonstrate competence in using advanced technology, such as ECDIS1), use of effective communication, and ability to transmit and receive visual signalling such as, the Morse code signalling in the area for navigation safety. Under the function for controlling the operation of the ship, the officers will have to demonstrate their competence in ensuring compliance with pollution prevention requirements, and application of leadership and team working skills such as Bridge Resources Management (BRM). One of the main amendments in this chapter is the inclusion of minimum certification requirements of ratings as able seafarer deck.2) This new requirement leads to standardization of the competence level of the able seafarers specially in the knowledge and skills in handling of deck and mooring equipment. The STCW Manila Amendment Chapter III prescribes the standards for seafarers working in the engine department. The on board training requirements for officers in charge of an engineering watch or designated duty engineer, on seagoing ship powered by main propulsion machinery of 750 kW propulsion power or more, has been increased from 6 months to not less than 12 months as part of an approved training program including on board training with a documented training record book. Another main amendment in this chapter is the introduction of a new minimum certification category for Electro-Technical Officers and Ratings. The purpose of this category is to address the increasing demand for such expertise on board the vessels due to the electronic control system of the ship is main propulsion and equipments. The Engine-Room resource Management (ERM) and team-work and leadership training are now mandatory at both the operational and management levels. STCW Chapter V is standards regarding special training requirements for personnel on certain types of ships. This includes tankers and passenger ships. There are two levels, i.e. basic and advanced training, of certifications requirements for both the oil and chemical tankers, and liquefied gas tankers. 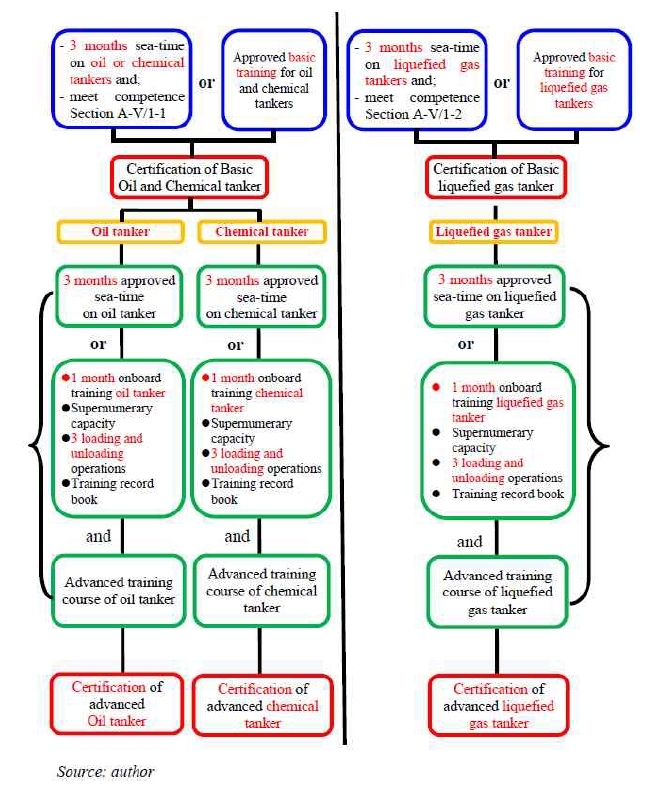 The requirement for certification in basic training and advanced training for oil, chemical and liquefied gas tankers are summarized in Figure 2. The point is all officers and engineers who has immediate responsibility for cargo handling need to have basic tanker training course and sea-time experience of tanker ship. In addition to the basic fire-fighting course, new competence requirements in carrying out fire-fighting operations on all types of tankers have been included. The STCW Manila amendments chapter VI incorporates proficiency in emergency, occupational safety, medical care and survival functions. The term “Certificate of Proficiency” has replaced the phrase special certificate or documentary evidence, as appropriate to ensure consistency of interpretation among administrations. The refresher training requirements were vague in Chapter VI, Section A. The requirement of “within five years” for basic safety training and other proficiency training was left for parties to interpret loosely before. (Safety4sea, 2011). The new Section A-VI/1, 2 and 3 has been included to ensure that competence for such training is being maintained. The refresher training may be carried out in the form of E-learning, shipboard drills and training or shore based training. The objective for amending these regulations is to reduce fatigue. However, the consideration should be taken prior to inception of the exception clause in the STCW Manila Amendments, Section A/VIII, paragraph 9. Further details on this issue will be discussed in Chapter 3 of this study. 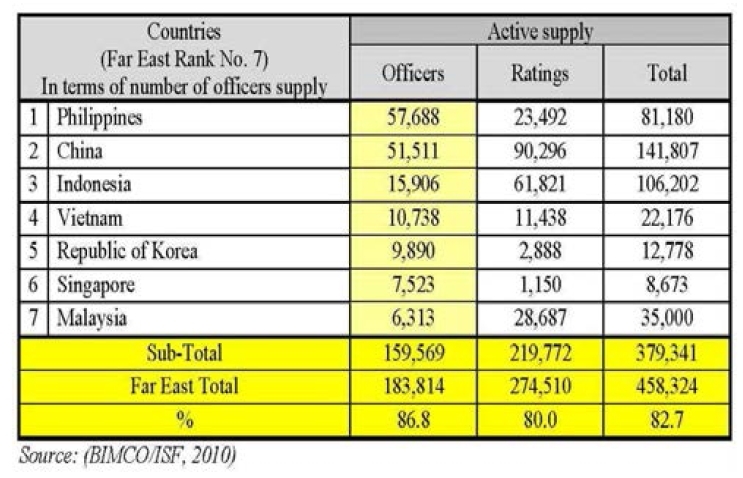 These countries cover 86.8% of officers and 80.0% of ratings supplies in the Far East region. Therefore, these countries have been selected for detailed research on the challenges faced in the implementation of the STCW Manila Amendments. Questionnaires were sent to the seven (7) MET institutes or universities that are in charge of seafarers training under STCW Convention in their countries, in these 7 countries respectively. As it will be an uphill task to conduct questionnaire surveys for all MET institutes or universities located in the 7 countries, one main MET institute has been chosen in each country for the purpose of this research. The list of questionnaire replies received is listed as follows. It is noted that Indonesia did not reply to the questionnaire. Hence, in order to understand the challenges faced by Indonesia, the report submitted by the Indonesia to the Association of Southeast Asian Nations (ASEAN) related to STCW Convention has been referred to instead. The purpose of the survey was to investigate the challenges faced by each country in implementing the STCW Manila Amendments. These 7 countries represent 86.8% of the officers supplies in the Far East region. The STCW Manila Amendments are more comprehensive as compared to the previous version. Many core training courses have been made mandatory instead of optional. More emphasis has been put on the mandatory qualifications requirements of officers and ratings other than deck and engine. The STCW Manila Amendments also shows support in introducing more technology based on training methodology and they harmonize some of the certification requirements with other international conventions. However, it is not all a bed of roses. Based on the questionnaire survey conducted, some MET institutes or universities are facing problems in implementing the requirements as mentioned above. There are several reasons that led to insufficient placements capacity for on board training to cadets. High costs in building and maintaining of training ships are one of the contributing factors. 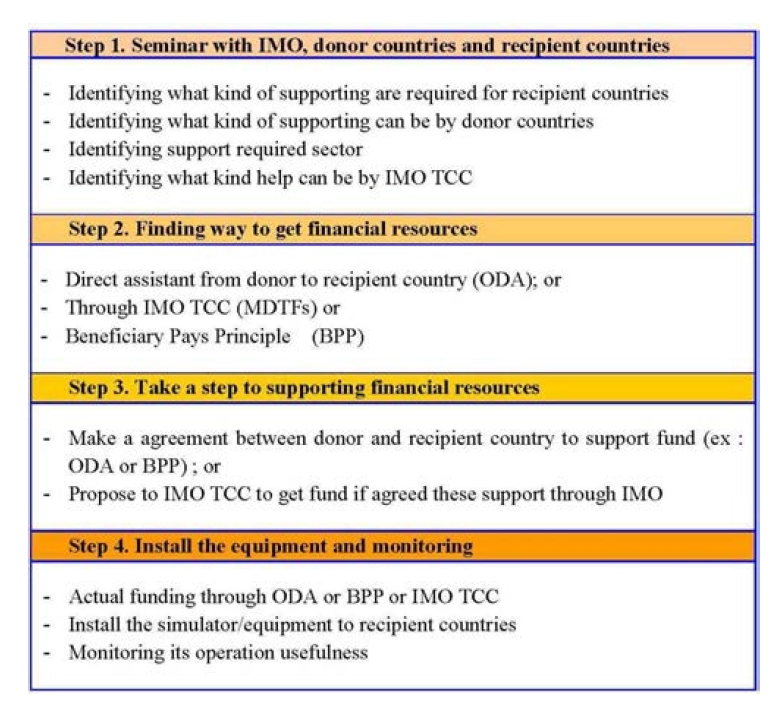 15) IMO TC fund, MDTFs, Bi-lateral arrangements, other arrangements and one-off cash donations. 16) Integrated Technical Co-operation Programme(ITCP) which is to assist governments which lack the technical knowledge and resources that are needed to operate a shipping industry successfully. b) Lack of trainer resources for monitoring and assessment. c) Difficulty in assessing distance learning and E-learning course by administrations. The STCW Convention, focuses on standardizing qualification, training and certification for seafarers. Taking ‘standards’ as the concept, a Joint Asia Maritime E-learning System (JAMES) could be established to provide global E-learning courses for developing countries that have difficulty in implementing such training courses. It is, of course, not a mandatory requirement to provide distance learning and E-learning to seafarers. However, it will be popular since it has good advantages as mentioned in Chapter 3. Figure 4 illustrates the possible approach of JAMES. 18) Parties may allow the training of seafarers by distance learning and e-learning in accordance with the standards of training and assessment set out in section A-I/6. The use of technology could be a solution to reduce the time required for doing paperwork and improvement in data recording procedures. For instance, “Det Norske Veritas (DNV) has developed the DNV Navigator, a computer-based tool that relieves the workload of the bridge team, secures ship operation and reduces costs and risks”(SSG, 2008). This system contains port entry information and checklists to assist specific to ports. This proposal is in line with IMO Facilitation Committee’s (FAL) vision, as the committee is also looking at “Electronic means for the clearance of ships” in a Single Window System (MLTM, 2010) to facilitate and simplify the vessel’s clearance processes. By moving towards the electronic platform, it will definitely reduce the paperwork load. The IMO instruments are binding, but do not sufficiently restrict countries and companies to specific manning levels. This leads to the proliferation of questionable manning scales where economic motives appear to be more of the issue than the principles of safety manning. 20) United Nations Convention on the Law of the Sea(UNCLOS), duty of the flag state. 21) Principles of Safe Manning, IMO Assembly 21st session. The SOLAS consolidated edition 2009, mainly stipulates the certification requirements on ships for providing safe manning, with the objective of ensuring sufficiency and efficiency. ILO Convention C180, article 11 also stipulates rest hours for seafarers. However, there is no particular procedure for determination of minimum safe manning levels. Most of the flag states determine safe manning based on the size and type of ship. In order to unify this difference, developing mandatory international regulations which have more binding power to determine reasonable manning levels on board ships will ensure proper application of hours of rest regulations requirements. Due to safety and commercial reasons, there are a series of inspection requirements, such as PSC, FSC, classification society and major oil companies. However, at a lot of times the items in these inspections are duplicated. To resolve the duplication of inspection items, it is hence proposed to harmonize the inspection requirements. For a start, each PSC region could consider recognising other PSC region’s inspections which are conducted within 6 months. On the commercial side, the requirements from different oil major companies may be harmonized through the common platform of OCIMF, or recognising the inspection results from other major inspections (Chae, 2009). If the mandatory and commercial inspections can be combined as suggested above, it will reduce the multiple inspections burdens on ships, specially the tankers. This will help to improve hours of rest compliance on ships. The STCW Manila Amendments have recently added mandatory ECDIS, BRM and ERM training courses. Furthermore, the STCW Manila Amendments have added 84 new competence areas where methods for demonstrating competence has approved simulator training (DNV, 2010). According to questionnaires research DMU, Indonesia MET institutes and VIMARU required enhanced ship simulator/equipment in order to provide those training courses. However, large capital investment is required for installation of training simulator/equipment. Hence, most of the MET institutes surveyed required more time and financial support. MET institutes or universities which are lacking in training simulator/equipment could be supported by other developed countries such as Japan and EU countries which has interest in obtaining deck and engine officers to serve on board their merchant ships. For example, training institutes could be established in the Far East main seafarer supply countries such as in the Philippines. These efforts can be a possible approach to assist developing countries in enhancing their MET institutes and programs by installation of training simulator/equipment. However, this initiative should be restricted to certain MET institutes which are located in certain countries since the capital investments are restricted. As this initiative will involve regional involvement, it could be funded by IMO (MDTFs)24) or BPP25) or ODA programs to resolve the financial difficulties faced by the developing countries in installation of simulator/equipment. Figure 5 shows possible procedure for funding. 24) Multi-donor Trust Funds(MDTFs) which provide financial and in-kind support to the ITCP. To eliminate the possibility of misinterpretation of KUPs which is not yet in-place after the STCW Manila Amendments, the HTW sub-committee26) and MSC27) may require that new IMO model courses which were newly added in the STCW Manila Amendment, be developed as soon as possible. Also, before developing new IMO model courses, the training providers need to work together between themselves as well as the administrations to ensure uniform compliance. Each trainer has different teaching skills and levels even if they are all working in the same country and institutes. Some trainers may having very good skills or knowledge to teach whereas some trainers may not. (Rae, 2002). These differences may affect directly or indirectly the competence of seafarers. Therefore, a certain acceptable level to assess a qualified person is required. Hence, it is recommended to insert a definition for ‘qualified person’ in the STCW Convention, in order to ensure the acceptable level for such trainers. Also, the JAMES concept (see Figures 4) should be useful to ensure standardized teaching skills or related knowledge. Lastly, it is also vital to determine the issuing party for tanker ships training books. It Should be the Administration, or, by MET institutes on behalf of the Administration. Discussions of HTW sub-committee should be carried out together with parties to the STCW Convention to determine whether the issuing body of such training books. This paper attempted to identify the changes in the STCW Manila Amendments and the difficulties or problems faced by the MET institutes or universities in the Far East region. It also looks at the possible solutions for the difficulties or problems. The 7 MET institutes or universities chosen are located in these Far East countries in accordance to the ranking of the largest officers suppliers country to the least. Among them, this paper identified some difficulties in implementing the STCW Manila Amendment through questionnaires. 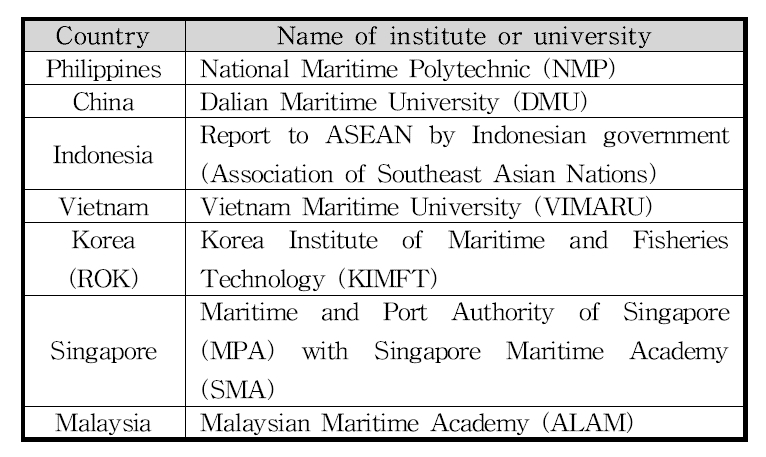 Based on the outcome of the research, the author has developed the following recommendations to the Far East major seafarer supply countries, MET institutes, universities and IMO to solve their difficulties or problems with effective implementation of the STCW Manila Amendments. a) The JOBTC can be good solution to provide on-board training services to cadets who have difficulties to meet on-board training requirements. 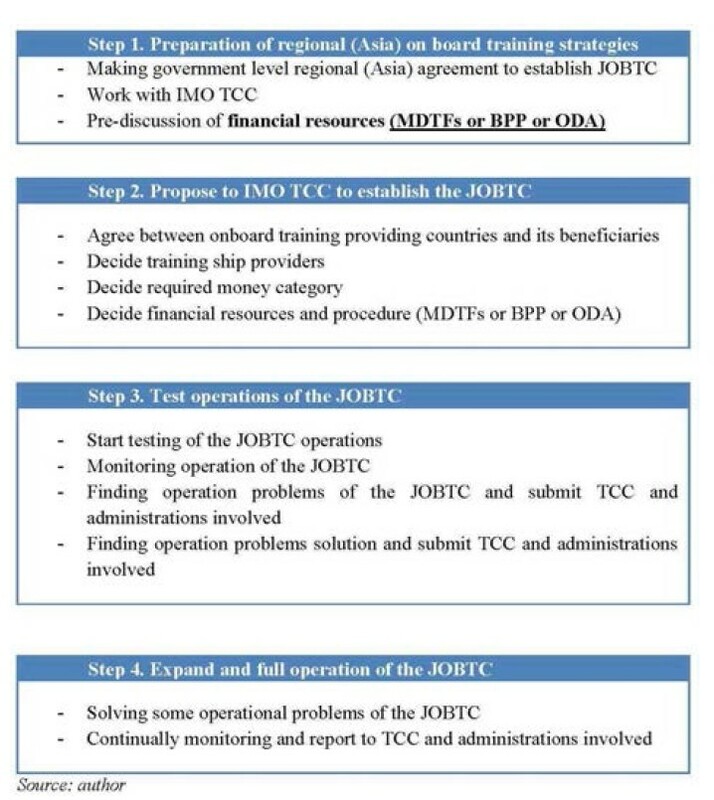 b) The MDTFs from IMO, Beneficiary pays principle from interested bodies and ODA from developed countries can be good financial resources to establish JOBTC. Further, these financial resources also can be used for installation simulation/equipment for developing countries who required more advanced training systems to meet the STCW Manila Amendments. c) The JAMES can be good solution to provide global E-learning education programmes for seafarers who are staying in different countries. d) The use of technology could be a solution to reduce the time required for doing paperwork and improvement in data recording procedures. The developing mandatory international regulations, which have more binding power to determine reasonable manning levels on board ships, will ensure proper application of hours of rest regulations requirements. e) It will reduce the multiple inspections burdens on ships if the mandatory and commercial inspections can be combined specially the tankers. This will help to improve hours of rest compliance on ships. f) The STW sub-committee of IMO should clarify the vague terminology of “qualified person” and make sure who can be the issuing party of training books for tanker ship training. Also, the training providers have to work together to ensure uniform compliance of KUPs. 3.Chae, C. J. (2009). "Suggestion of Improving Measures with the Status Analysis for Ship Inspection by Major Oil Companies", Journal of Korean Navigation and Port Research (p.4). Busan : Korea Maritime University. 5.Ermal Xhelilaj, K. L. (2010). "The Role Of Human Fatigue Factor Towards Maritime Casualties", Maritime Transport & Navigation Journal,2 (2010), No. 2, 26-27. 6.International Convention for the Safety of Life at Sea, 1974, and its Protocol of 1988, (Consolidated Edition 2009), IMO, (2009). 9.International Maritime Organization. (2007). The linkage between the integrated technical Co-operation programe and the millennium development goals (Res A. 1006(25)). London: Author. 10.International Shipping Federation. (2011). Guidelines on the IMO STCW Convention including the 2010 'Manila amendments' Thrid Edition (pp. 4-7, 13-16, 64-72. London: Author. 12.Maquera, Z. G. (1998). "An administrative perspective on the implementation of STCW certification in the Philippines", (p.19-25). Unpublished master's thesis, World Maritime University, Malmö, Sweden. 14.Ministry of Land, Transport and Maritime Affairs. (2010). The report of the 36th Session of FAL COMMITTEE. Seoul : Author. 15.Rae, L. (2002). Trainer Assessment: A guide to measuring the performance of trainers and facilitators. England: Gower Publishing Company. 17.UN Convention On The Law of the Sea (1982).